For a number of years, AD&M showcased its diverse aspects in it’s program, Dance: Up Close and Cultural. 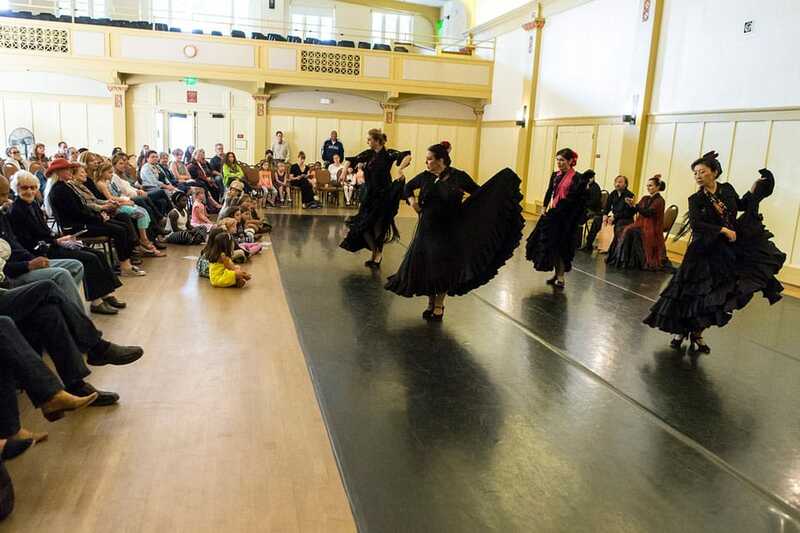 These free community performances promoted accessibility to dance for the entire community, children and seniors in particular in the informal and relaxed setting of the Carrillo Recreation Center. The events featured performances of contemporary ballet by AD&M Performance Group as well as presentations by invited guests who specialize in world dance forms such as Afro-Brazilian and Flamenco. This event was enjoyed by audience members of all ages. After 2015, the Carrillo Rec Center was no longer able to host the performances, and AD&M looked for a new, suitable venue. Now, AD&M has found that venue—in its new home, The Dance Hub on 22 East Victoria Street. The performance, now called “Up Close at The Dance Hub”, will be held on April 28, 2019. For 2016, rather than doing one free performance at a single location, we are taking our beautiful and inspiring works to senior and community centers throughout Santa Barbara and Goleta. These five FREE shows featuring AD&M Performance Group will present excerpts of works from their diverse and compelling repertory, some of which will be presented in full at the New Victoria Theatre in November, 2016. All performances are open to the public. AD&M’s fifth free commnunity event was held at the Carrillo Recreation Center in Santa Barbara. The event included new and repertory works by artistic director Carrie Diamond and guest artist Mari Sandoval. There was an open class with AD&M Performance Group. AD&M’s first free public workshop was held at the Carrillo Recreation Center in Santa Barbara. Performances included Lizabeth Skalski’s Midnight Tangle, two excerpts from Brian Carey Chung’s Ah, Love! Let Us Be True to One Another, a variation from Fokine’s Les Sylphides, an early work by Carrie Diamond, Eight Miniatures set to Stravinsky, and two Afro-Brazilian dances performed by Rachel Hernandez. Workshops included a dance demonstration by company dancers, a children’s workshop, and an Afro-Brazilian class for all ages. AD&M’s second free public workshop at the Carrillo Recreation Center included excerpts from Carrie Diamond’s Concerto Allegro, Diamond’s Terra Incognita, and Carlos Fittante’s Wayang Blues as well as full performances of Brian Carey Chung’s Interlude and Benjamin Harkarvy’s Premonition. Afro-Brazilian dancing by Rachel Hernandez and Balinese dancing by Carlos Fittante provided the world dance elements. AD&M’s third free commnunity event was held at the Carrillo Recreation Center in Santa Barbara. Repertory danced by the AD&M Performance Group included Jumble, a new work by AD&M director Carrie Diamond, in which Carrie made her Santa Barbara dance debut coming out of retirement after 20 years! Also featured are Spanish classical and flamenco dancer, Mari Sandoval, and Afro-Brazilian dancer Rachel Hernandez. AD&M’s fourth free commnunity event was held at the Carrillo Recreation Center in Santa Barbara. The event included Pastorale, Carrie Diamond’s new work danced by the AD&M Performance Group set to music of Beethoven played live by music director Eric Valinsky; Turkish by Matisse, a solo danced by Ms. Diamond choregoraphed by guest artist Mari Sandoval; and Cardinal Sin, a dance-theater collaboration with DramaDogs based on a recipe by Julia Child. Ms. Sandoval presented her company in the premiere of La Vida Breve, a classical Spanish work set to the music of Manuel De Falla.